Ambient Weather has made a name for itself online as one of the top manufacturers of weather instruments, with options ranging from basic traditional instruments to fully-featured digital weather stations. 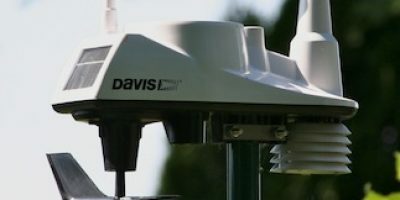 The Ambient Weather WS-1002-WIFI-OBSERVER is one of its weather station offerings and is likely intended to match up with the Davis Vantage Vue in terms of feature set and capability. The company has achieved that. The WS-1002 does what the Vantage Vue can do and more. You’ll get all the necessary weather variables, like temperature, humidity, barometric pressure, wind speed and direction, and rainfall. Plus, you’ll also get some things the Vantage Vue doesn’t have, like UV and solar radiation measurements. For those features, you’d need to step up to a Davis Vantage Pro2, and pay additional as UV and solar sensors are not included in the base package—which drives up the overall price. The WS-1002 also does connectivity very well. It is one of the easiest stations to set up with Weather Underground or the Ambient Weather Network. You'll also have the option to connect your sensors to IFTTT to control other devices such as blinds, lights and sprinklers. While you might not get the accuracy a Davis station offers, it’s not inaccurate by any means, and the extra functionality at no additional cost is commendable. The Ambient Weather WS-1002-WIFI OBSERVER tops our list of value weather stations because it is able to do much of what the more expensive Davis Vantage Pro2 and Vantage Vue can—plus a little more—at a price that is more affordable to a broader segment of consumers. 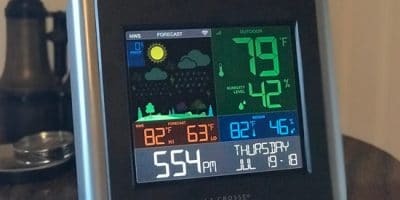 While it might not be as accurate as a professional weather station, it’s still within an acceptable range, and its connectivity options are top notch. Value or Pro Weather Station? Installation of the WS-1002 is like many other stations in its class, requiring some basic assembly. Most of the station comes pre-assembled, so what you’ll need to do is just attach things like the wind vane and the mounting pole. Altogether, you’re looking at about a half hour or so to get set up. Once you have the batteries in, the WS-1002 should start reporting to the console once you’ve gone through the setup process there. If you’ve decided to put your data on Weather Underground, it’s a good idea to do this before you set up the console: the setup process there actually asks you for your WU login information—and it’s easiest to do this right away rather than later. The WS-1002 gets good marks overall for its accuracy for its price point, although it does have some quirks. Sensors seem to be generally on par with other stations in the category, such as the ones for barometric pressure and wind speed and direction. The ‘cup and vane’ method is similar to the system professional weather stations use, and as long as you have the sensor unit in an area clear of obstruction, you should get pretty accurate readings regardless. One area where the WS-1002 does struggle somewhat is in rainfall measurement. Reviews suggest that the station does underreport rainfall in certain situations, which may pose a problem for those requiring more accurate rainfall measurements. If that’s the case, we would recommend you turn to the Davis Vantage Pro2, and pay the price premium for better accuracy. Additional sensors like the UV and solar radiation sensors work as expected, and are an excellent addition for outdoor enthusiasts where data like this would prove useful. While the WS-1002 does offer more functionality regarding what you can measure out of the box; like the Vantage Vue, it does not provide the option for expandability. This is somewhat disappointing considering what it can do otherwise. If that’s not a requirement for your purchase decision, then this shouldn’t be a factor on whether you consider the WS-1002. Like we said at the beginning—the WS-1002’s internet connectivity is one of its best features. The Weather Underground includes this station as one of the recommended models to getting your data online, and they couldn’t have made it easier to do so. Unlike the Davis stations it is included, so you won’t have to pay anything extra for a connectivity module or software. You’ll enter your Weather Underground details during console setup, so make sure you’ve registered your station with the service first. Once that’s done, the data should start appearing on the service in a few minutes. The WS-1002 can also connect to the Ambient Weather Network for weather monitoring across all devices. You can use the cloud service to not only view your home weather information but send text and email alerts for high and low conditions for every parameter. You'll also have the ability to connect the weather station sensors to IFTTT and control other gadgets such as lights, heating/cooling units and sprinklers. Data can be stored on your computer for later perusal, but it is also stored to an SD card: there’s a slot in the console itself for it. The WS-1002 stores this in Excel format, according to the documentation (As an aside, that SD card slot also makes easy firmware upgrades possible too). There are two things we really like about the WS-1002: its price and the connectivity. For what you’re getting overall with this station, the WS-1002 is of great value. The console is sharp looking, and the construction, while not as robust as Davis, is still more than sufficient for most applications. For those of us looking to get our weather data online, the Ambient Weather WS-1002-WIFI OBSERVER is one of the top options we’ve seen. It’s so easy—even the most technologically challenged shouldn’t have too much of an issue getting everything online. The WS-1002’s lack of expandability is a real disappointment. Ambient Weather did a great job in getting a lot of functionality into this model but seemingly stopped short of hitting a home run by making it expandable. While the WS-1002’s feature set is sufficient for most, it’s nothing like other stations in its price class (Acurite’s My AcuRite system for example), which gives you the ultimate in customizability options. Other than that, there isn’t much not to like about Ambient Weather’s effort here. From an accuracy standpoint, yes. The Davis Vantage Vue and Vantage Pro2 both do better overall in terms of accuracy and to some extent durability. 5-in-1 sensor suites—common on many mid-range models—can pose some issues in ensuring you’re getting the most accurate readings (due to limitations on sensor placement), so stepping up to the Vantage Pro2, even though it’s considerably more expensive, is still our recommendation if accuracy is most important to you. Otherwise, if you are looking for something more affordable then we recommend the Ambient Weather WS-2902. The WS-2902 has the same sensor suite as the WS-1002 but with an updated and improved design and an LCD display console instead of a TFT display. Before we conclude, we wanted to take a few minutes to discuss why you should consider a value or professional weather station. While we have a lot of good things to say about the WS-1002, we do still believe that the Davis models are superior in many ways. But do you really need a professional grade model? If accuracy is your biggest concern, professional grade weather stations are your only option. Sensors in these systems are of higher quality, and typically the manufacturers here have decades of experience in producing weather instruments. Because of the higher quality, durability is better. This means your station will last longer. However, if your interest in weather data is more casual, a value priced weather station makes more sense. 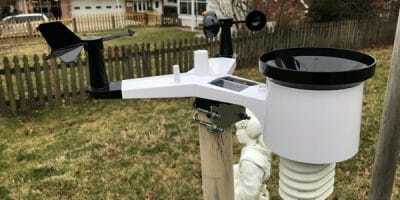 Most value weather stations have acceptable reliability and accuracy, even if they may be constructed cheaply. Do keep in mind though that thinking long term is important, having to replace a value station more often than a professional grade one might just negate any price benefit you’re getting. We always recommend buying stations that are a little bit more than you need. This gives you a bit of room to grow, so to speak. Our answer to this question is an emphatic yes. The WS-1002 is one of the top value priced weather stations on the market right now. While Ambient Weather doesn’t have the market share or name Davis does, for the price you pay you’re getting quite a bit more than other stations in its range. Its connectivity options are top notch, and accuracy solid enough that you’ll get a clear picture of what the weather’s doing. If you cannot afford the higher priced Davis stations, there’s no reason why the Ambient Weather WS-1002-WIFI OBSERVER shouldn’t be one of your ‘next best’ alternatives. The Ambient Weather WS-1002-WIFI OBSERVER doesn’t quite stack up to a Davis Instruments station when it comes down to accuracy, but the WS-1002 is still no slouch in this department. A user-friendly internet setup with the Ambient Weather Network and Weather Underground is the main selling point, and this makes the home weather station a great value for money purchase for a weather enthusiast who wants a quality product with a simple installation.